After a full day of picking and processing I left De Salis with 6 full drums of Merlot. I added a small amount of sulphur dioxide to all of the drums to protect the grapes during transport and ensure only the strong yeasts survived. The aim is to produce a low intervention, minimalist wine that has been handled carefully. It was a long drive with the grapes on the back of the ute. By the time I got home it was late, so I decided to leave the drums overnight and attempt to get them down in the morning. After getting the drums down and into the courtyard I was ready to start my solo effort in home/garage winemaking. I was surprised to find that although it was a rough ride back in the ute, most of the grapes were still pretty well intact. The four drums of destemmed fruit had a decent amount of juice in the bottom and the whole-bunch barrels only had a little. When I think of wine made at home, I gag! Most tends to be faulty, caused through poor winemaking, hygiene and oxidation. I've made plenty of wine before, so I'm hoping I can produce commercial quality garage wine at home. From my point of view the main problem at home is controlling oxidation and keeping things sterile. Drums of Merlot Grapes Ready to Load Up. Note Whole Bunch. 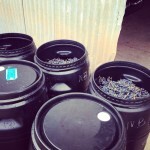 One Response to "Home Winemaking – Sydney Bound"
Howdy! check n go installment loan very good website.